More than 500 years before Christopher Columbus came to America, a tiny bald cypress seedling sprouted in the mucky ground beside Bayou de View in eastern Arkansas. The tree took root about the same time Viking raider Leif Eriksson discovered North America. It was 100 years old when the Crusades started in medieval Europe. By the time Spanish conquistador Hernando De Soto tramped through the area on his way to fame, glory and an early death, the cypress had stood almost six centuries. Scientists say the tree has lived more than 1,000 years. I felt humble standing alone in the shadow of this ancient one, casting spinnerbaits for bass. When a 3-pound largemouth walloped my offering, I set the hook and enjoyed the skirmish. But my mind was elsewhere. How many bass, I wondered, had lived among the knees surrounding that magnificent tree? How many men had fished beneath the tree during the millennium it stood? Alone in the swamp, I spoke to the tree. I cannot fish beneath a cypress without feeling such awe. Most are much younger than the Bayou de View tree, but the fascination is no less powerful when the trees have lived two or three centuries instead of a millennium. The oldest trees have largely disappeared, victims of logging. In the early twentieth century, millions of cypress trees were cut to obtain lumber for boats, barrels, ties, shingles, posts and interior finish. In the 1920s alone, the U.S. harvest was almost one billion board feet. Fortunately, some ancient trees in remote locations escaped the ax man’s blade. Along North Carolina’s Black River, there are some even older than the Arkansas giants. For 1,600 years they have survived, placing them among the Earth’s oldest living things. 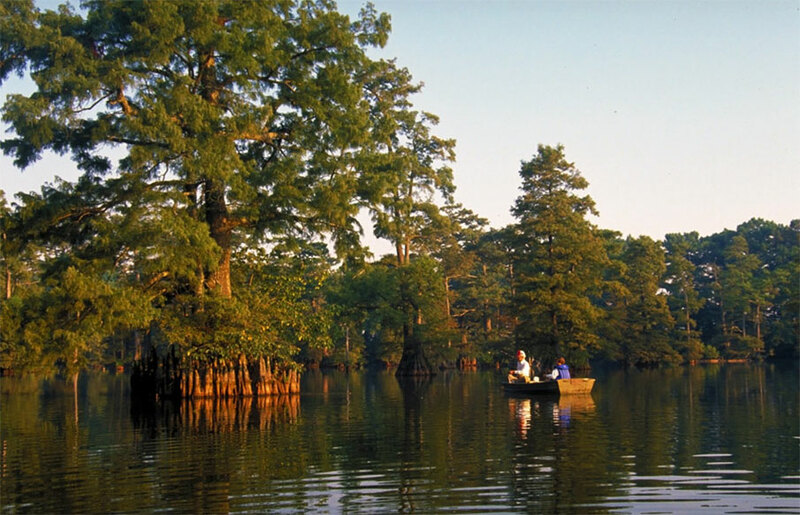 The vast cypress swamps of the past exist no more, but throughout much of the southern and eastern U.S., you still can fish on rivers, bayous and lakes cuffed with spectacular stands of cypress trees. To visit some of these places is to enter a world treacherous and foreign. Gnome-like knees erupt from coffee-black waters inundating massive 100-foot-tall trees. Shrouds of Spanish moss often festoon the branches. The trees’ flaring bases — twisted with age, scarred from lightning strikes and ripped by dark hollows — sometimes exceed 12 feet in diameter. Many fishermen have waited out storms crouched inside large, hollow specimens. Cypress trees do not always grow in trolls’ swamps and backcountry bayous, however. They lend beauty to state park lakes and scenic roadside oxbows. They grace waterways flowing through many major cities. In spring and summer, the soft, tiny needles paint a broad stroke of brilliant green along the water’s edge. In autumn, they transform to a rich russet hue mirrored in the water. No tree is more beautiful or bewitching. I am drawn to cypress waters for all these reasons. Fishing in the shadows of these ancients, I feel an incomparable sense of time and history. I see the ghosts of voyageurs and Indians pass beneath the bending boughs. I hear the striking songs of prothonotary warblers and the murmuring winds of the backcountry. I smell the earthy aroma of fertile water and scented trees. And during the fleeting hours of each allotted visit, I bask in beauty so deep and enchanting, it penetrates my soul and washes it clean. Despite all this, cypress trees are just the icing on my cake. They are charming, for sure, and captivate me as diamonds dazzle a debutante. But when I visit cypress lakes, I come to fish, not gawk. I often fish for crappie. On some days, it seems you can pull one from inside every cypress hollow and beside every knee. An angler wielding a cane pole and minnows, or a jigging pole and jigs, will have little trouble finding them if he dabbles his enticements around the trees’ broad, fluted buttresses. Largemouth bass are the pugilists of cypress waters, striking with jabs and upper cuts that leave topside opponents reeling. On my many solo fishing junkets, I’ve learned they are suckers for a chugger or plastic worm cast directly into the side of a broad tree and allowed to land below. Sometimes the bass wins the bout; other times I manage a KO or decision. Either way, I find unexcelled thrills in this type of bass fishing. Another species—the longear sunfish or “sun perch”—is my favorite cypress-lake resident. One could not imagine a creature more beautiful. This gorgeous fish blazes with colors—aquamarine back and sides with gold and emerald speckles, a face of green or tangerine, a lemon-yellow to orange belly and opalescent veins of turquoise striping the cheeks, nose and gill covers. Catfish inhabit these waters, too, often in great abundance. One should fish at night to truly appreciate these whiskered warriors and the magical world in which they live. At times, offerings of chicken liver or night crawlers will not reach the bottom before a channel or blue cat inhales the enticement. The ugly ol’ flathead lurks here, too, and in cypress waters where they are especially plentiful, you’ll stay busy baiting your hook with minnows or crawfish and enjoying fish-a-minute action. Such times are unforgettable, certainly, but nights that have etched themselves indelibly on my memory were not, for the most part, fish-a-minute nights. I remember most those peaceful evenings when I rested beneath an ancient cypress and listened to the wind purring through the soft boughs overhead. On nights like that, if you’re right with your soul, you will hear the voices of a thousand years.